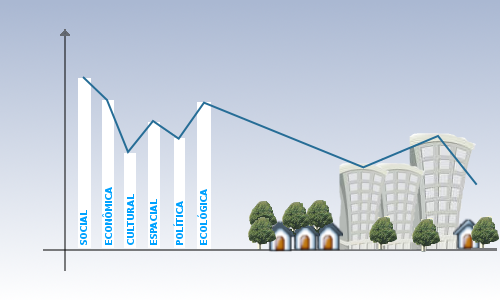 This page has been developed in order to publish the results of the analysis of 40 sustainability indicators, within the six ecodevelopment dimensions proposed by Ignacy Sachs (social, economical, cultural, spatial, political and ecological), as to the 34 coastal municipalities of the State of Rio de Janeiro. All information here is subject to complete or partial reproduction as long as its authorship is mentioned. SOUTO, R.D. Atlas of Sustainability Indicators for Coastal Municipalities of the State of Rio de Janeiro. [online] http://www.ivides.org/atlas_en/, accessed in 4/26/2019. The calculated indexes refer to the negative impact of activities and dynamics developed by Human throughout his occupation of the coastal zone of the state of Rio de Janeiro. To know more about the methodology used in this analysis, click here. To see the page with the sources of data, click here. To know why the analysis of sustainability indicators is important, click here. To visit the page with the digital maps, click here.